At the end of August 2009 I took early retirement largely because I could no longer cope with a stressful job, and after 36 years’ service felt I had no more to give. Basically, I felt worn down and worn out, and was at an emotional low. Within a month or so of retiring, I saw an article in the South Wales Echo about the Cardiff Rivers Group (CRG). I have had an interest, albeit a passive one, in the environment for some considerable time, and have always hated seeing litter, so I thought that I would take a chance and join this group. I now think this was one of the best decisions I have ever made! 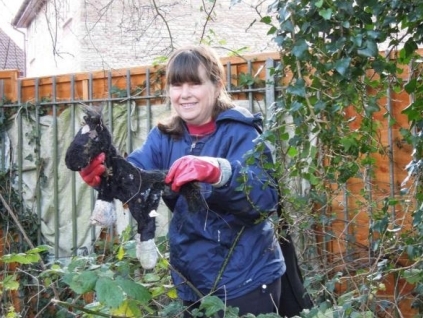 Sue with a discarded toy in St. Mellons. One of my aims when I retired was to pick up new interests and widen my social circle. I also did not want to be tied into a routine, which was why I shied away from volunteering for anything which committed me to regular attendance. The CRG has met all of these ideals and more! 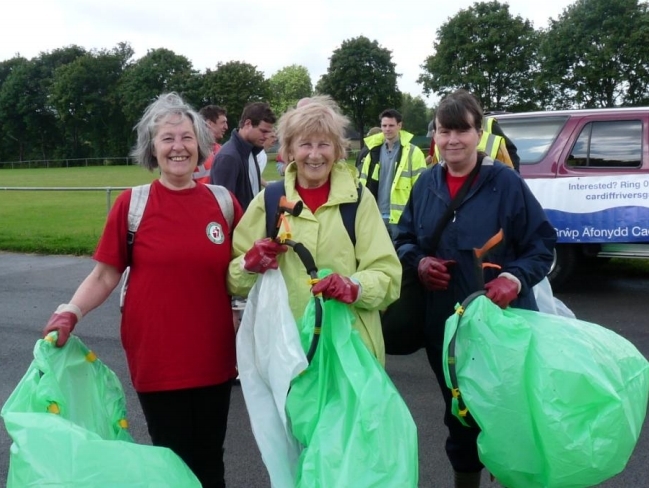 It has also enabled me to join other, similar groups, such as Cardiff Friday Mornings Environmental Project (CFMEP). Nine years ago, I suffered badly from sciatica, which affected both legs, and resulted in me being off work for 6 weeks. I consulted a chiropractor who helped enormously in my recovery, and I still visit him every 6 months for a check up. I was not in the habit of taking regular exercise, and worked in an office, both of which may have lead to the sciatica being so severe, and the subsequent long recovery. My most recent appointment was this week (January 2012), and I was able to report that, for the first time, the residual ache has finally gone from my left leg and hip. 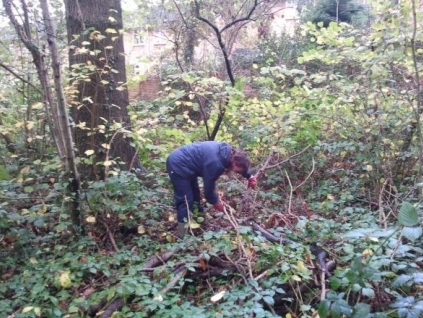 I explained to my chiropractor that I could tell that my back and legs have strengthened since working with the voluntary groups, as I find it easier to get up the river banks now and I get much less back ache. He observed that he could tell that my muscles are much more developed than he has ever seen them, and said that this was exactly the sort of exercise I should be doing, and keep up the good work! 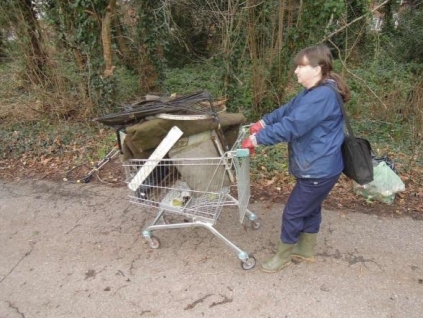 Hauling a trolley load in Pentwyn. Not only have I reaped the rewards physically, but emotionally too. The experience of working with groups of pleasant, dedicated people, getting out in the fresh air, especially on days when I would otherwise stay indoors, seeing parts of Cardiff I have never seen before, including the rivers in all their glory, and the delight experienced by feeling useful and making a difference have all contributed towards repairing the emotional damage done in the last few years of my working life.